Today I have a fun post that I am excited to share with you! I have been having way too much fun making these nail polish ornaments! I've had a few fails but I am starting to get the hang of it. I've seen a few people make these and was interested but wasn't quite motivated until I saw this post by Nails Always Polished. Her ornaments looked so good because of the decorations she added to the outside of the ornaments. That was my original intent in starting these but I've still been too afraid to mess up any of my pretty ones. These are my neighbor and family gifts that I'm giving out this year. I gave away a few before I took any photos but I still have some good ones here to share. They still smell like nail polish, but hopefully that will fade away soon! It's that time of year and Christmas is almost upon us! With all your hustling and bustling you may not have had much time for your nails. Well I hope you can find some time to relax and enjoy yourself. Of course one of my favorite ways to relax is to paint my nails! 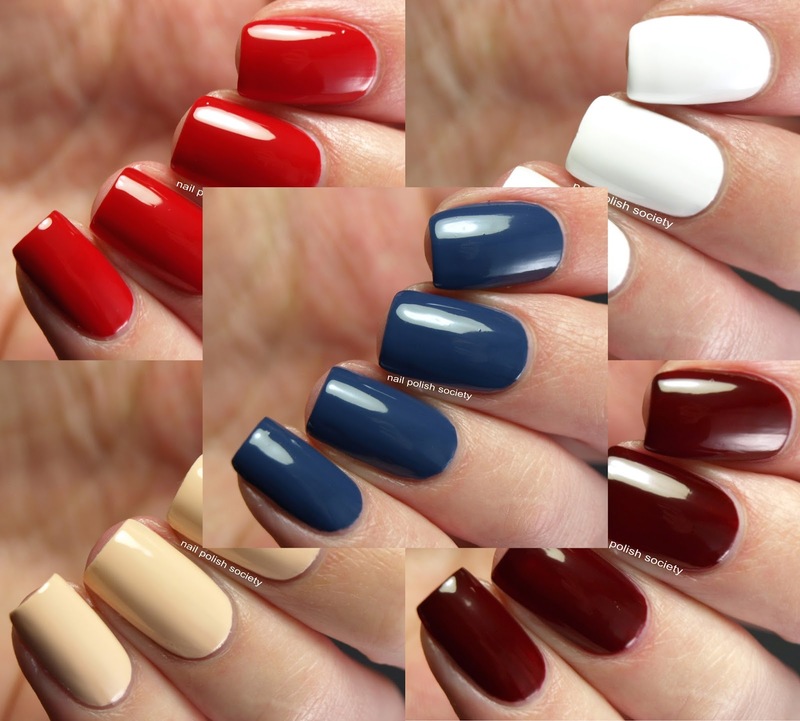 I've created some mostly simple nail art looks if you wanted to spice up your holiday manis. 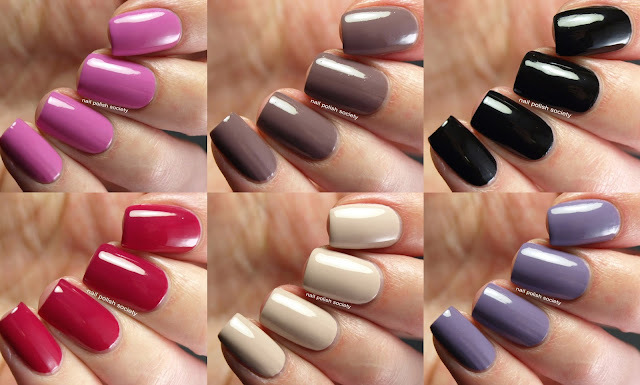 You can pick one look to do on each nail, just for an accent, or mix and match them. I hope you find a little inspiration here and enjoy all the festivities! Happy Monday everyone! How are your Christmas preparations going? I have so much that I wish I could get done, but I'm just too doggone tired! So I'm trying to just relax a little and do what I can. Today I'm back with Part 2 of my Formula X for Sephora creme swatches. I'm going to jump straight to them, so for more information please refer to Part 1. I'm back with another Colores de Carol polish today! This one is a special edition, a real party shade for the New Year! A quick word about the formulation- Colores de Carol polishes are all 5-free. Now let's take a closer look. I have lots of photos to show off all its angles! Feliz Año (Happy New Year) is a "linear holographic clear base with platinum silver micro flakes". I love everything that's going on in this seemingly straightforward shade. The silver flakies are super reflective and then once you get it in the sunlight a delicate rainbow peeks through. The formula was nice and smooth. The application was good and I achieved the desired coverage in two coats. Hello lovelies! Christmas is almost upon us and to celebrate I have a little giveaway! It's been almost a whole year since my last giveaway and felt it was about time for another. And what better time than Christmas to gift one lucky reader with free stuff? So I've put together a few products that I love and I wish you the best of luck! I have one final guest blogger this year, and a very special one at that. I am so very pleased to introduce Lucie of Lucy's Stash! I'm sure many of you are already fans of hers as I have been for quite some time! I follow her work for inspiration as she is always so creative and on trend. I'm really excited to have her here and just love the nail art she's created for this post. Hi everyone, I’m Lucie, Lucy’s Stash and I’m so happy to be here today and guest post for Emily! As she is enjoying the arrival of her baby girl, she has asked me and other bloggers to contribute with some nail art post. Emily is very lovely blogger and I feel so honoured that I could get to know her a bit more. Hi ladies! I have some swatches of a brand I haven't featured for some time even though it's one of my favorites. Today's post is a LONG time coming. These photos have been chilling out in my computer since January! But I haven't forgotten about them, and today is their day to shine. Last Christmas I bought the Formula X for Sephora Paint the Town set. It contained a whooping 22 mini bottles of varying formulas. I usually try to stay away from minis because they never apply as well with their tiny brushes. Still this had so many polishes, I couldn't resist buying it so I could try them all. I feel like I don't see enough Formula X in the nail blog circuit. I know it's mainly because of its limited availability and partly because of the higher price ($10.50-$12.50). So I had planned on swatching the whole set for those who want to get a better idea of the polishes. The descriptions and images on Sephora's site aren't sufficient enough. I haven't gotten to all of them yet, but I did begin with all of the cremes since that's my favorite formula. These are all part of the permanent line and are categorized under "The Colors". The set contained eleven cremes which I have broken up into two posts. Hello my lovelies! I always get so excited when I get to share posts like this. 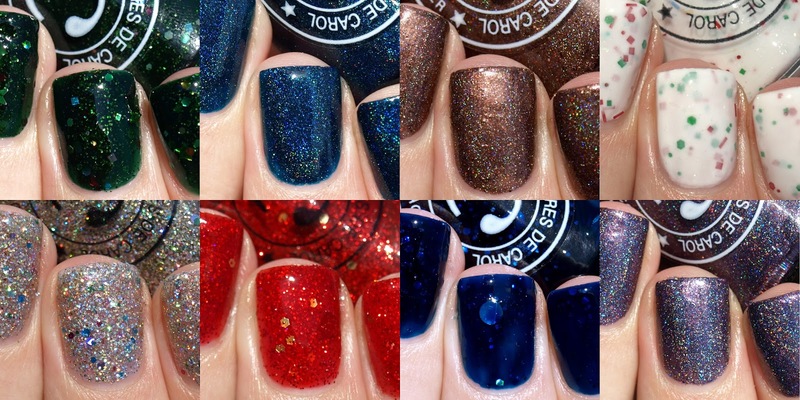 Today I bring you the Colores de Carol 2015 Winter/Holiday Collection. The collection is made up of eight polishes and if you remember last year's Winter/Holiday collection, there is a similar variety of formulas and finishes in this one too. The whole thing says fun and festive, it really put me in the holiday spirit! Dzień dobry moi drodzy! I am just thrilled to share with you today's guest post brought to you by the amazing Paulina's Passions! I have been following Paulina's blog since I started blogging and have loved every single thing she does. Her manis are classy, photos are perfect, and she is the queen of florals. I have tried to recreate her magic on a few occasions including this attempt at her Nautical Rose Nails, one of my favorites of hers. My recreations are never quite up to snuff but I'll keep trying! It is no surprise that Paulina has created the perfect floral nail art once again, but this time it's for little ol' me! Squee! Hi my lovelies. Here it's Paulina from Paulina's Passions. 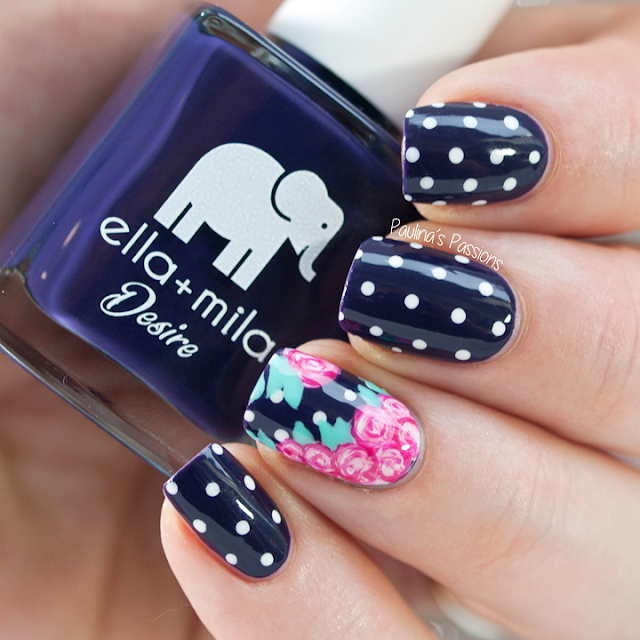 Today I am taking over Emiline's blog to show you a cute floral nail art. I am so excited to be here as I have been an admirer and reader of Emiline's blog for ages and she is one of of my favorite bloggers! As you may know she just had the cute, little baby Alice and to take some of the blog work off her shoulders I am writing a blog post for her. Let's take a look at some pretty flowers. I'm so excited to share with you another fabulous guest post! Today's post is brought to you by my wonderful friend Emily from Very Emily. I am so happy to have her grace my blog once again. I am such a huge fan of all she does, although she's a terrible enabler that makes me want to buy everything she wears! Take it away Emily! Hi everyone! 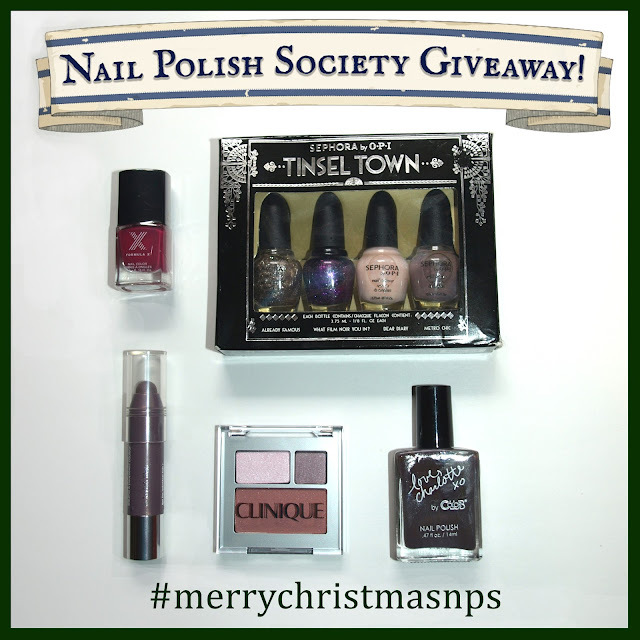 I'm Emily from the blog Very Emily and I am super excited to be here on Nail Polish Society today! This isn't my first time gracing Emiline's blog. I did a guest post for her last year when she was celebrating her 1st blogiversary. She also has cause for celebration this time, the birth of her gorgeous baby girl Alice. She is just so precious! Of course I had to do some pink nails, dedicated to baby Alice!